This timely and accessible book is the first to provide a thorough analysis of the 2008 Constitution of Myanmar (Burma) in its historical, political and social context. The book offers an in-depth exploration of the key elements of the 2008 Constitution in theory and practice. The book canvasses the historical foundations of the Constitution and the issue of credibility raised by the past process of constitution-making. The book identifies and articulates the principles of the Constitution through an analysis of legal and political process since the 1990s. It highlights critical constitutional contestations that have taken place over fundamental principles such as democracy, federalism, executive-legislative relations, judicial independence and the role of the Tatmadaw (armed forces). This book suggests that the 2008 Constitution is crucial to the establishment and maintenance of the military-state. The military-state promotes the role of the military in governance, including its ideology, and insists on a qualified notion of democracy and loyalty to the Union. The Constitution represents a codified and hybrid system, blending remnants of its earlier model of parliamentary democracy with an agenda of socialist-military legality. From its inception in the 1990s, this constitutional vision and its associated institutions have been the subject of fierce contestation. Not least is debate over the militarisation of governance through direct and indirect means. Central to the future of the Constitution and the military-state in Myanmar is the role of the Tatmadaw in governance, and the extent to which the country may shift from a highly centralised Union to a federal or decentralised system of governance. In this volume, experts on Indonesian law and courts reflect on the growth and changes in the role and function of courts in Indonesia. Indonesia’s judiciary is a critical part of its democratic system. Since the transition from authoritarian rule in 1998, a range of new specialized courts have been established, from the Commercial Court to the Constitutional Court and the Fisheries Court. In addition, constitutional and legal changes have affirmed the principle of judicial independence and accountability. A raft of judicial reform programs have been pursued to address various issues within the judicial system, not the least of these being corruption. The growth of Indonesia’s economy, combined with the size as the fourth most populous country in the world, means that the courts are facing greater pressure to resolve an increasing number of disputes – from contracts to property disputes, criminal matters, or family law. The aim of this volume is to offer in-depth reflections on the role of the courts and legal reform in Indonesia. The chapters acknowledge that late Professor Dan S Lev was a leading scholar of the politics of courts in Indonesia. The chapters share a common concern by reconsidering the relevance of Lev’s work in light of the changes to the judiciary in Indonesia. Not least of these is the question of whether Lev’s reflections on legal culture, and particularly his concerns about the increase of corruption and the decline in professionalism, remain true today and to what extent legal reforms have addressed these concerns. This volume will be of interest to scholars of law, political science, law and development, Asian Studies, the politics of courts, and law and society. This volume offers a timely reflection on law, development and economics through empirical and comparative perspectives on contemporary Myanmar. The central theme of the book is to understand the business that takes place in times of major political change through law and development initiatives and foreign investment. This book identifies the way in which law reform creates new markets, embodies hopes of social engineering and is animated by economic gain. This book is an invitation to think carefully and critically about the intersection between law, development and economics in times of political transition. The chapters in this volume speak to a range of common issues – land rights, access to finance, economic development, the role of law including its potential and its limits, and the intersection between local actors, globalised ideas and the international community. This interdisciplinary book is for students, scholars and practitioners of law and development, Asian Studies, political science and international relations. 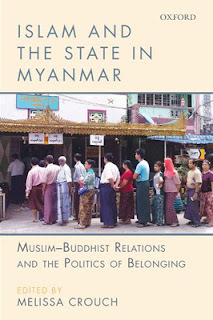 The edited volume aims to reinvigorate scholarship on Islam in Myanmar, to explore the diversity within the Muslim community, to offer new empirical research, and to bring a scholarly perspective and insight into complex issues raised by the position of Muslims where they form a minority in states across Asia. It brings together a wide range of scholars from Burma Studies, Islamic studies and a wide range of other disciplines – international relations, political science, history, law and anthropology. Importantly, it also features a number of chapters by Muslim scholars from Myanmar, some based in Myanmar while others are based abroad, who represent a diverse range of ethnic backgrounds. My own chapter focuses on Islamic personal law in the general courts in Myanmar as a site of interaction between Muslims and the state. “This highly informative yet eminently accessible set of studies of Islam in Burma/Myanmar is surely most welcome by specialists and general audiences alike at multiple levels. These thoughtful and authoritative studies of the mediation of competing claims in national politics and policy are celebrated for defying the myth of the orthodoxy of Middle Eastern Islam and its pretensions of Islamic states." Professor Abdullahi Ahmed An-Na‘im, Emory University Law School and author of Islam and the Secular State: Negotiating the Future of Sharia (2008). "For all too long, Muslims in Burma/Myanmar have remained an ‘invisible minority’, and the attention they’ve begun to receive in recent years has come only in the sad context of persecution and violence. This book succeeds not only in providing much needed historical, sociological, and political contextualisation of recent developments and trends, but also in restoring Islam and Muslims to their rightful place as established fixtures and active forces in the making of Burmese history and society. Melissa Crouch and the other authors in this volume have done a great service – intellectually and politically – by assembling this excellent collection of essays. "A first glimpse of Muslims in Myanmar, this book sets the stage for what will hopefully become a new field of research on Islam in Southeast Asia. Bringing together a wide range of voices, Crouch provides a window from which we can peer into the precarious lives of people who have until recently been unknown to the global, reading public. Professor Anver Emon, Faculty of Law, University of Toronto, and author of Islamic Natural Law Theories, and Religious Pluralism and Islamic Law: Dhimmis and Others in the Empire of Law (OUP). In a field of scholarship where it is assumed that Buddhism is the primary influence on the state and the majority of Myanmar’s citizens, this book makes an important intervention in breaking ground for the further study of a minority group in Myanmar that is not only marginalized politically but virtually ignored academically." This is the first edited volume to address the dynamics of the legal system of Myanmar/Burma in the context of the transition to democracy. It includes contributions from leading scholars in the field on a range of key legal issues now facing Myanmar, such as judicial independence, constitutional law, human rights and institutional reform. It features chapters on the legal history of Myanmar; electoral reform; the role of the judiciary; economic reforms; and the state of company law. It also includes chapters that draw on the experiences of other countries to contextualise Myanmar's law reform process in comparative setting, including Myanmar's participation in regional bodies such as ASEAN. This topical book comes at a critical juncture in Myanmar's legal development and will be an invaluable resource for students and academics seeking greater understanding of the legal system of Myanmar. It will also be vital reading for a wide range of government, business and civil society organisations seeking to re-engage with Myanmar, as it navigates the challenges of transition towards democracy and the rule of law. 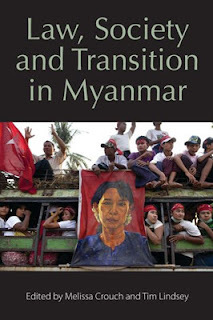 Note: this book is also available for purchase in Myanmar from the Myanmar Book Centre, and Monument Books in Yangon. 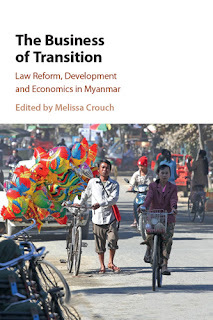 "With chapters contributed by renowned legal experts and specialists on Myanmar, it explains how law is understood in Myanmar and how it works in practise"
"...this volume will serve as a good reference work for scholars interested in Myanmar by highlighting the importance of legal reform in its nascent transition." Understanding and managing inter-religious relations, particularly between Muslims and Christians, presents a challenge for states around the world. 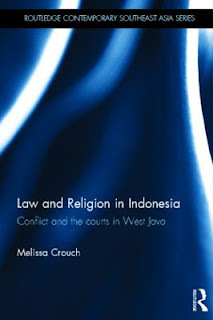 This book investigates the judicialisation of religion in the world’s largest majority-Muslim, democratic country, Indonesia. It examines how the interaction between state and religion has influenced relations between religious communities in the transition to democracy. The book presents original case studies based on empirical field research of legal disputes in West Java, a majority-Muslim province with a history of radical Islam. These include criminal prosecutions for blasphemy, as well as cases of judicial review, relating to disputes concerning religious education and permits for religious buildings. The book argues that the introduction of democracy has increased the politicization of religion. It highlights the way in which disputes since 1998 have been localized through the decentralization of power and exacerbated by the central government’s ambivalent attitude towards radical Islamists who disregard the rule of law. The book examines the challenges facing governments to accommodate minorities and manage religious pluralism, and furthers understanding of state-religion relations in the Muslim world. This accessible and engaging book is of interest to students and scholars of law and society in Southeast Asia; Islam and the state; politics of the courts; and the legal regulation of religious diversity. Husni Mubarak (2014) ‘Babak Baru Ketegangan Islam dan Kristen di Indonesia’ 21(3) Studia Islamika (Indonesian Journal for Islamic Studies) 579-600. or see the link to short version of the article here. Kikue Hamayotsu (2014) ‘Conservative Turn? 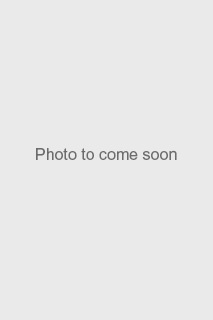 Religion, State and Conflict in Indonesia’ 87 (4) Pacific Affairs, 815-825.